Hotter temperatures are possible for tomorrow, with highs reaching the mid 90s to nearly 100 degrees from NYC and further north/west, although a cold front on Friday will end the heat along with bringing a risk of scattered thunderstorms, possibly heavy, during the afternoon hours. Temperatures won’t immediately cool down, staying in the lower to mid 80s during the weekend with dry conditions, although with a trough returning into the region, a colder pattern will develop for next week. Tomorrow will be the last very hot and humid day of this heat surge, with temperatures again surging into the mid to upper 90s from NYC and further north/west, and the lower to mid 90s in most of Long Island/S CT, reaching the upper 90s closer to NYC. 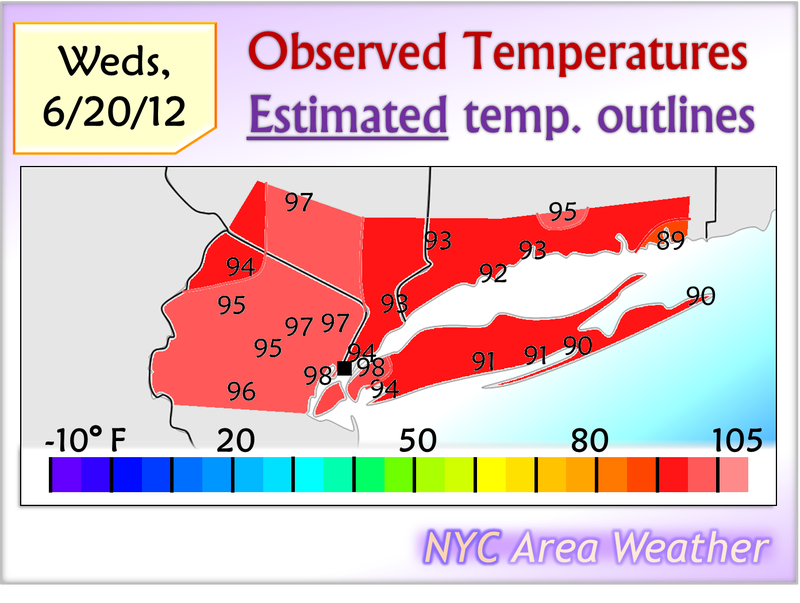 Temperatures in parts of the immediate NYC area may reach 100 degrees, although most places will be closer to the upper 90s for highs. 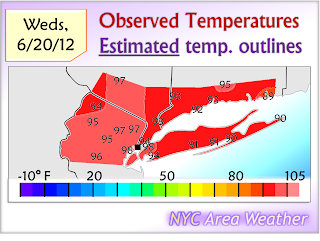 Heat index values are again expected to reach the 100-105 degree range in the immediate NYC area while approaching 100 degrees inland. With the cold front approaching, temperatures will quickly warm up again on Friday morning, with temperatures peaking earlier than usual in the upper 80s to lower 90s inland, in Long Island/S CT, and the lower to mid 90s in the immediate NYC area. Scattered thunderstorms, some of them heavy, are expected with the cold front especially during the afternoon and evening hours. More information will be posted on Friday’s storm potential with Thursday’s update. Behind the cold front, a cooler air mass will move in, although temperatures will remain close to average, reaching the lower to mid 80s across the area with mostly to partly sunny skies expected. No rain is expected during the weekend, although some rain is possible into Sunday night. With an upper level low dropping into the region, another round of below average temperatures accompanied by some rain and clouds is expected for most of, if not all of next week. The most extreme model solution today came from the 6z/12z GFS runs which took a strong low pressure up the coast with a strong trough covering the entire region. The GFS solution is likely exaggerated, although there is increasing confidence in a low pressure moving through the region on Monday with periods on rain and possibly thunderstorms between Sunday night and Monday night. For now, I went with a 65% chance of rain for Monday in the 5-Day Forecast page, although as long as there’s no significant changes this probability will likely be increased with Thursday’s update. Temperatures are expected to be below average as well, likely ending up in the mid 70s range, possibly a bit cooler or warmer depending on the exact amount of cloud cover and rain. Following Monday’s rain event, a strong trough to the magnitude of what some of the earlier model runs showed is not very likely, although colder than average temperatures will still continue, with highs through mid-late next week staying in the 70s, possibly in the lower end of the 70s depending on cloud cover and rain chances. Beyond the middle of next week, no significant heat is expected for the region for the medium range, although some moderation in the cool air mass is possible. Stay tuned for more information on the longer range.